A popular way to test bots is to ask them questions like “Harry is taller than Dave. Who is the tallest?”. In this tutorial, I’ll explain how I allow Mitsuku to work with objects and comparisons. Warning: You will need to have a pretty good grasp of AIML to follow this tutorial but I’ve made an example of the source code here (learn.aiml). First, we need to make a list of the different kinds of comparisons people are going to ask about. Things like taller, faster, younger, quicker, slower etc. For this tutorial, I’m just going to concentrate on “x is taller than y.” but it can easily be adapted for other comparisons. We’ll make a set called comparisons containing the different types. Here is an example but you can probably think of extra ones to add. For each of these, we need a category like below. 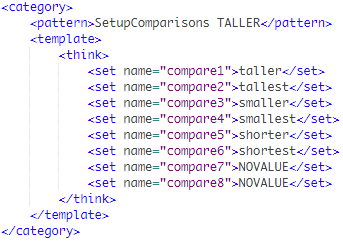 The different compare predicates are to allow us to be able to ask questions like, “Who is the tallest?”, “Is Harry taller than Dave?”, “Who is shorter than Dave?” and so on. Most categories will just contain 4 compare predicates (the 2 opposites) like below but this method allows for different ways of asking questions. We also need a category to reset the comparisons after each query or the bot will get confused with old information. Finally, we need to teach the bot how to learn new pieces of information. So we create a category like this, which we can call to set up new categories automatically using the <learn> tag. This works by passing 2 parameters to a category called SetUpNewCategory. The first parameter is the pattern, the second one is the template. We use the word XSPLIT to act as a splitter between the 2 parts, as it is unlikely someone is going to say XSPLIT to your bot. The bot then sets up a new category using the <learn> tag. If the user says “x is y than z” (Harry is taller than Dave), where y is one of our comparisons, the bot will match this input and say, “Ok. I will remember that.” to the user. It now needs to create new categories to handle any subsequent questions about this. 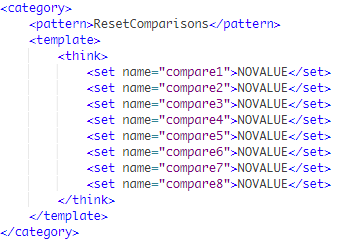 The first step is to blank out any comparisons from previous interactions by calling the ResetComparisons category we created earlier. The bot now needs to call SetupComparisons find the different compare predicates to be able to set up new categories. Finally in this stage, it sets up predicates called object1 and object2 which are the left and right parts of the user input. This will now automatically set up a new category which will allow the bot to answer our question. This method will answer the user’s questions but involves a lot of <srai>ing. Once you feel confident with the technique above, we can make a few shortcuts to make the process more universal. Instead of asking about Harry and Dave, let’s assume the user said, “Mount Everest is taller than the Eiffel Tower.”. In this case, they would then ask, “Which is the taller?” or “What is the taller?” rather than “Who is the taller?”. Passing other question starters (Who, What, Where, Which) to LearnNewQuestions allows us to set up all the different categories we need to answer questions. In a future tutorial, I’ll show you how to expand these queries to allow your bot to be able to handle questions with extra objects like, “Harry is taller than Dave but shorter than Pete. Who is shorter than Harry?” but for now, I hope this is useful in your bots.